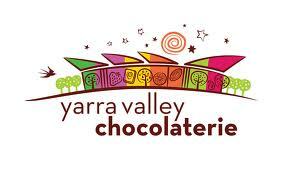 Easter wouldn't be complete without overdosing on chocolate, where better to indulge than in the heart of the Yarra Valley? I had received recommendations from many people at work who insisted that I should visit and I really wasn't disappointed. There are three coverture chocolate sample bowls as you walk in the door, each with a dainty server inviting you to take a handful. You can watch the chocolatiers at work in their workshop and their creations are all on sale in the store. I was very impressed with the chocolate infused with native Australian flavours and I hinted to my husband that he should take me there for my 30th birthday in June, although by that point we will have our baby (I'm currently 32 weeks pregnant) so it may be a bit of a juggling act. After scouring the shop and checking out ever display and product we sat in the cafe and I ordered a dark coverture hot chocolate with soy milk. It was truly decadent and I can't wait for my next trip to try some more of their goodies (especially the salted caramel chocolate spread).